Most of the time, your Amazon Kindle won’t need any maintenance outside of battery charging. Like any device that runs software, however, it may occasionally become unresponsive, sluggish or unable to act the way that it should. In instances like these, resetting your Kindle could set things right. 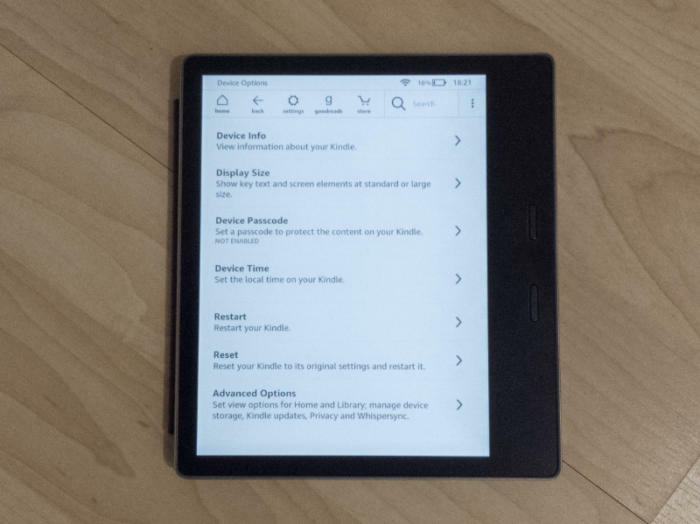 No matter whether you're resetting or restarting your Kindle, you'll need to find this menu. To restart your Kindle, turn your Kindle on. If you’re in the middle of reading a book, return to your device’s Home screen. Next, tap the Menu icon (three vertical dots located at the top right of the Home screen,) and select Settings. Now, tap the Menu icon again. Halfway down the list of options you’ll see the option to Restart your Device. Tap this option and your Kindle will restart. If Your Kindle stops responding to your touch or button input, or becomes sluggish or otherwise uncooperative, performing a hard restart may restore it to its former glory. To conduct a hard restart, simply press and hold the power button for six to eight seconds. After around 10 seconds have gone by, your Kindle’s display should go blank. Don’t panic: This is part of the Kindle’s restart process. Continue to hold the power button for one minute, then release it. When you release the power button, you’ll note that the charge indicator light (the location of this light will vary, depending on which Kindle you own) will turn on. Once this happens, your Kindle will restart, allowing you to start reading, once more. All of your downloaded and side-loaded content will be waiting for you, right where you left it. If your Kindle continues to act wonky after forcing it to restart, it may be beneficial to reset it to its original factory settings. This is also a great way to prepare it before passing it along to a friend as a gift, or if you plan on selling it. You should know that resetting your Kindle will remove all of the downloaded or side-loaded documents you may have had on the device. Additionally, your Wi-Fi settings, Amazon account information, and any passcodes or parental controls you may have applied to the Kindle will be wiped. 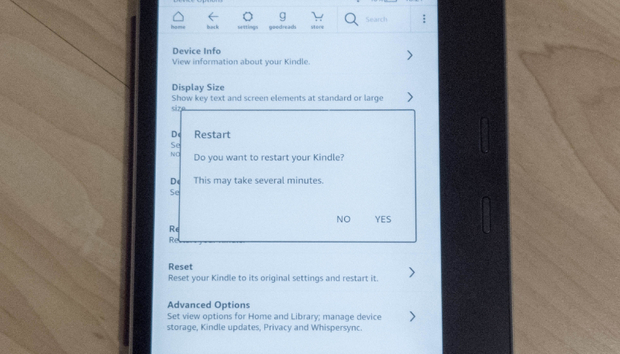 To perform a factory reset on your Kindle, turn your Kindle on. If you’re in the middle of reading a book, return to your device’s Home screen. Next, tap the Menu icon (three vertical dots located at the top right of the Home screen,) and select Settings. Halfway down the page, you should see a menu option titled Device Options. Tap this. Near the bottom of the Device Options page is an option labeled Reset. Select the option; doing so will open a dialog that asks you if you’re sure that you want to wipe your Kindle of all of its content and settings. If you want to continue, select Yes. All that’s left to do is wait for your Kindle to restart.